Lollapalooza has announced its full 2019 lineup, and its chock-full of some of music's biggest stars. Ariana Grande is set to headline the Chicago-based music festival, along with Childish Gambino, The Strokes, and Twenty One Pilots. The four day music festival will take place at Grant Park from August 1st through 4th. 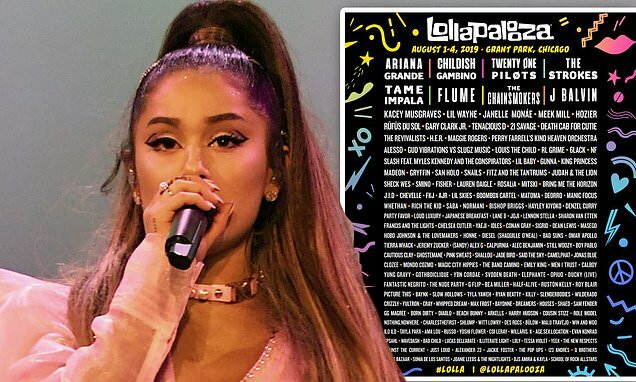 After becoming arguably music's biggest star over the course of 2018, Ariana has been rewarded with headliner spots across some of the world's largest music festivals. She began her 80-date Sweetener World Tour on Tuesday and now is adding another date to the already expensive concert series. The 25-year-old singer-songwriter will also be performing at this year's Coachella Valley Music and Arts Festival. Childish Gambino, real name Donald Glover, will also be headlining the multi-day Chicago event.